I was writing about my interest into political philosophy earlier today. Here follows the online reading list for the course provided by the joint action of students taking part. My special thanks to Jessica Anon and Hamish Morrison, and others for making the hard work of searching. Max Weber "Economy and Society" "Politics as a Vocation"
Niccolo Machiavelli "Discourses of the First Decade of Titus Livius" and "The Prince"
Jessica´s comments: "It is a cruel irony that Machiavelli was remembered for the one book he wrote about dictatorship and none of the dozens he wrote about democracy. Alas. Worth noting that it is unclear whether or not reading the Prince is expected to be important to this class at all, though it is clear that Machiavelli's other work is considered more important." Cerutti (2010) "Filosofia politica: Un'introduzione"
Hans Morgenthau "Politics among Nations"
Steven Lukes "Power: A Radical View"
Michel Foucault "Discipline and Punish" and Stephen Shapiro's reader/workbook on Foucault's "Discipline and Punish"
Kenneth Waltz "Theory of International Politics", "Man, State and War", and the introduction to it. David Easton (1957) "An Approach to the Political Analysis" (article) and "The Political System"
The extensive reading list is accompanied by a suggestion how to be able to manage it all. "Please start with Bobbio, in particular the chapter on the state, leaving aside for the moment the chapter regarding democracy and dictatorship. Then go over to Max Weber, in particular Economy and Society, vol.1, part 1, ch.1, in particular §§ 1,2,5, 8,9, 16,17. Weber's 'orgies of differentiation' (the ability to make distinctions and definitions remains nonetheless the highest virtue of a political philosopher!) may scare you; in this case turn to his more easy-going (if any in Weber's work!) Politics as a Vocation - in which you will however miss the conceptual completeness of Wirtschaft und Gesellschaft. This work is nearly hundred years old, this means a classic rather than a result of present theorization. David Easton's main work The Political System (1965) will soon be fifty, hence it cannot be said to mirror the present state of affairs in political science. But in the last decades I have not read a general conceptualization of politics equalling its overarching and vigorous character. Let me urge you to look around, perhaps finding a recent book, not necessarily in English, that may satisfy your needs in a way compatible with the method followed in this course. 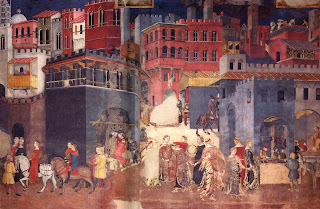 Among the classical readings that may serve as historical illustrations to some aspects of this first Part, try Machiavelli: not only and not so much Il principe (*The Prince* ), but rather the Discourses on the First Ten Books of Titus Livy, in which the role of institutionalized conflict for the preservation of the Roman Republic is highlighted. Also see Carl Schmitt's The Concept of the Political as an example of the search for the specificity of the political as different from other spheres of action. Kant on the other hand wanted to define the dependence of politics on rational-reasonable morality rather than its autonomy (see Appendix to Perpetual Peace ), but I would suggest to save him as well as Aristotle and Hobbes for the other parts of this MOOC." 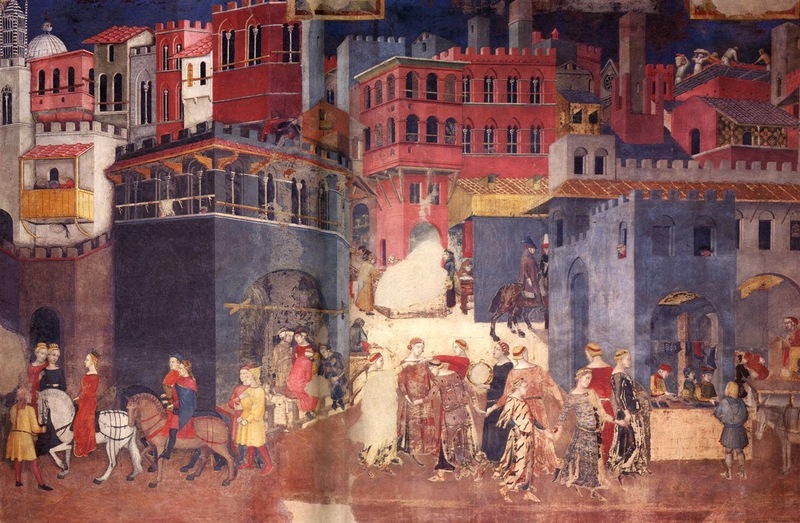 The illustrations to the post is a fresco of the Good and Bad Government by Ambrogio LORENZETTI.